MANILA, Philippines – Since 2013, three cities in Metro Manila have consistently topped the list in terms of number of road crashes recorded in their jurisdictions: Quezon City, Manila, and Makati. The 3 cities have posted double-digit figures in the number of road incidents in 2015 alone, data from the Metropolitan Manila Development Authority (MMDA) show. The number of road crash incidents in the 3 cities comprise 51% of the total 95,615 crashes recorded between January to December 2015 in the capital region. The 95,615 figure translates to roughly 262 road crashes a day – and that’s no joke. Data from the Metro Manila Accident Recording and Analysis System (MMARAS) also showed that while most of the road crashes reported every year happened during day time, the crashes that end up deadly mostly occurred at night and in the early hours of the morning. Among the local government units (LGUs) of Metro Manila, Quezon City recorded the most number of road crashes in 2015 with a total of 27,529 incidents. Meanwhile, the municipality of Pateros is considered the safest in terms of the number of road crashes, with only about 31 crashes recorded throughout 2015. Four of these resulted in injuries and 27 damaged properties. The map below shows the distribution of road incidents in Metro Manila. To navigate, click a shape and information on the city or municipality will be displayed. Darker shades mean more crashes in the area. Quezon City leads the LGUs in terms of car crash incidents, comprising about 28.8% of the total incidents in 2015. Of the LGUs, it also has the most number of fatalities, taking 146 lives in 2015. There were 4,466 injured individuals and about 22,917 damaged properties. Next to Quezon City are the cities of Manila and Makati with some 11,101 and 10,173 incidents respectively. In Manila, 83 of these incidents were fatal, while 1,338 resulted in injuries. In Makati, only 19 were killed and about 969 sustained injuries. The rest of the reports involved damage to properties. The MMDA said that the high number of incidents in these cities can be attributed to high social and economic activities happening in the area. The metro’s major roads – EDSA, Commonwealth Avenue, Quezon Avenue, Roxas Boulevard, and Radial Road – are also located in these cities. These 3 cities remain consistent in posting the highest number of crash incidents since 2013. 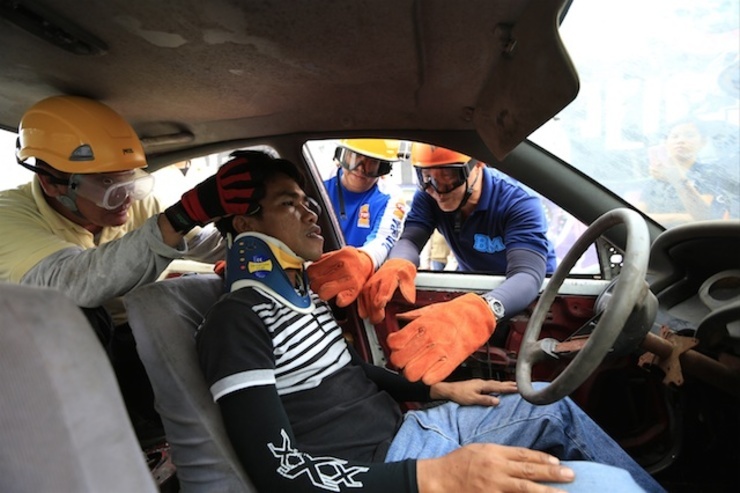 Among the Metro Manila LGUs, Pateros recorded the lowest number of car crashes – only 31 for 2015. There were no recorded fatalities and only 4 were injured throughout the year. The rest involved damage to properties. Following Pateros is Navotas with a total record of 730 incidents in 2015, of which 12 were fatal and 211 involved injuries. Malabon, meanwhile, had 1,095 car crashes: 5 died while 418 sustained injuries. These LGUs are considered the safest in the metro since 2013. According to the MMDA, these can be attributed to their smaller land area and the absence of major arterial roads crossing these LGUs. Meanwhile, MMARAS data showed that most fatal road crashes occur at night and in the early hours of the morning. The MMARAS defines day time as the period between 6 am to 5:55 pm, while night time is defined as the period between 6 pm to 5:55 am. The data also included fatal crashes with no time recorded. In 2013, a total of 86,565 road crashes were recorded, with 53,897 or 62.26% of incidents occurring during the daytime and 32,668 or 37.74% of incidents occurring during night time and without time indicated. But of the 411 fatal incidents recorded, most happened at night: 277 cases compared to 134 cases in the daytime. The same trend can be observed in the 2014 and 2015 data, but with the number of total fatal crashes increasing by over 100 incidents in the 2015 data. In 2014, 90,258 road crashes were recorded, with 56,127 or 62.19% of incidents occurring during daytime, and 34,131 or 37.81% of cases happening at night. As in the 2013 data, most of the 418 fatal incidents occurred at night: 257 cases, compared to 161 cases in the daytime. The number of road crashes in 2015 increased to 95,615, or a difference of 5,357 cases. Most of these incidents also occurred during the day – 59,604 incidents – versus the 36,011 incidents occurring at night. While most of the crashes occurred during the day, most of the fatal crashes happened at night. Of the 519 fatal crashes recorded, 314 happened during night time while 205 cases were recorded during the day. In its 2015 report on road safety, the World Health Organization (WHO) said that most of the road crash victims in the Philippines are motorcycle riders and pedestrians. The WHO also noted that the Philippines has laws regulating speed limit, mandating the use of motorycle helmets and seatbelts, and prohibiting drunk driving, but these have not been sufficiently implemented.